The Vegas Golden Knights have locked up one of their young players for a considerable amount of time, the team announced on Friday. 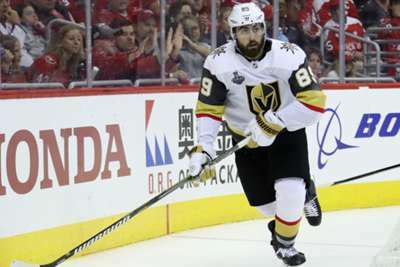 Vegas signed right winger Alex Tuch to a seven-year extension worth $4.75million per year. Tuch, 22, scored 15 goals and added 22 assists in his first year with the Golden Knights' organisation. He was the 18th overall pick by the Minnesota Wild in 2014, but was traded to Vegas in 2017. He has been on the injured reserve to start this season. Tuch was a restricted free agent after the season and was playing on a $925,000 deal for one year in 2018-19, according to Spotrac. Now the question is what Vegas decide to do with center William Karlsson, who is also a restricted free agent after this season. He is playing this year on a $5.25m deal. Karlsson led the Golden Knights with 43 goals last season.